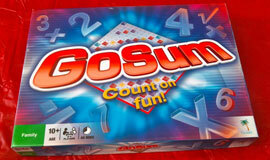 Virtual School Resources: GoSum Math App for iPod or iPad Fun! Kids love apps, there's no doubt about it. But a math app? I spent some time playing GoSum, Count On Fun! today, and I can definitely see how it could become addicting! Played like Scrabble, the object is to make a correct sum, horizontally or vertically, that is connected to an existing number. Easier said than done! It took me a while to get the hang of it, but once I did,I was on a roll! I beat myself in the first game 44 to 30! I passed the game on to my 13 year old daughter who played it for a few minutes and said, "I thought I was still on summer vacation!" She was not nearly as interested in the game as I was. Once we are back in the swing of the school year, I think this app would come in handy for practice in addition, subtraction, multiplication and division. In fact, I am betting my daughter would love it if I gave her the day off from Pre-Algebra to let her try her hand at it again. GoSum for the iPhone is available for download at the iTunes App Store for 99 cents. I can promise it will get you thinking again after this summer break! Do you have a favorite app for learning math? I'd love to hear about it in the comments below! This post is sponsored by your friends at GoSum. All opinions are my own.